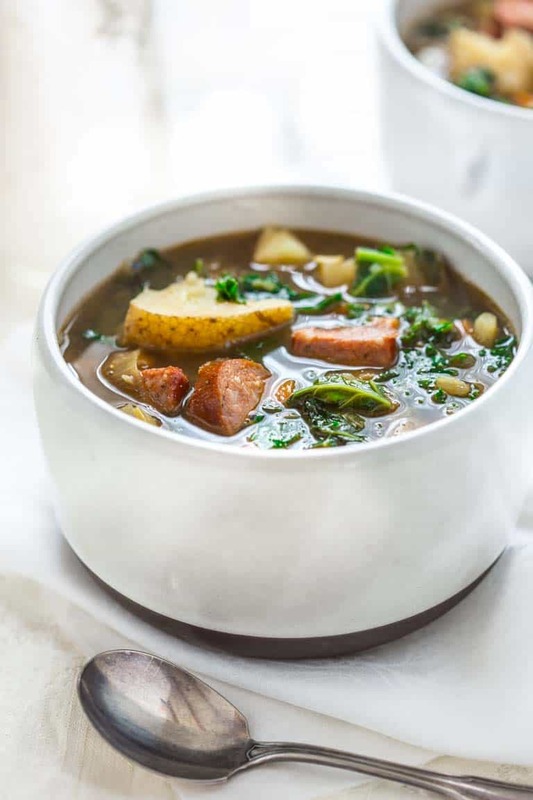 If you’re looking for a yummy but healthy Potato and Sausage Soup then, you’ll love this Potato and Kale Soup with Andouille Sausage! It is made with leek, carrot, celery and a little anise seed. It is only 260 calories per serving, it is naturally gluten-free and it’s ready to eat in 45 minutes! I originally shared this recipe on February 16, 2011. I have updated the images and some of the text today. 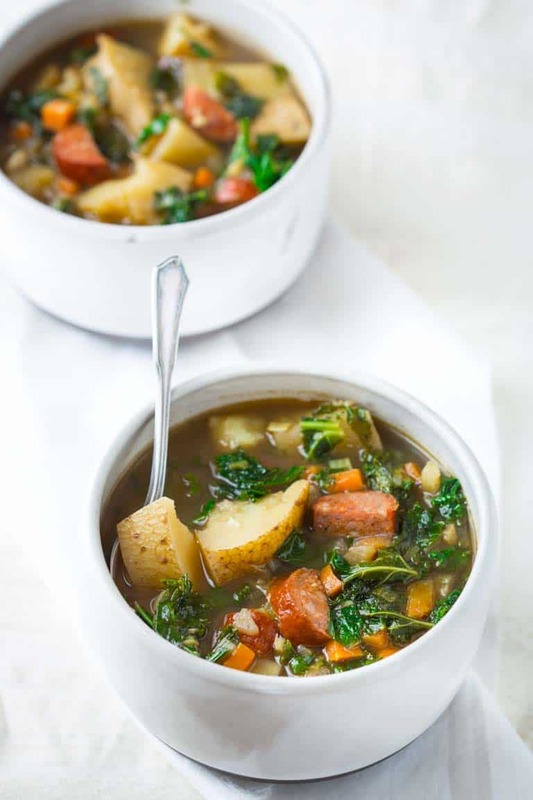 I’m going to get to this Potato and Kale Soup with Andouille Sausage in just a sec, but for a moment, can we discuss the lowly potato? Potatoes are the Rodney Dangerfield of the diet world. They don’t get any respect. I agree they aren’t exactly Mother Teresa either. Partially because they have made themselves so darned delightful tasting when fried or covered in cream and cheese. So they are seemingly guilty by association because of potato chips, french fries and potatoes au gratin. Add to that a little hang-over from the low-carb craze.If you strip all that away though they are actually a healthy choice. They are a very good source of Vitamin C, a good source of Vitamin B6, they have all sorts of minerals and heart healthy fiber. Furthermore, researchers at U.C. Davis found that over three months, people who ate five to seven servings of potatoes a week lost close to five pounds. I say, go ahead and give them the respect they deserve and let them have a place on your plate. I’m not saying bust out the curly fries and ranch though. 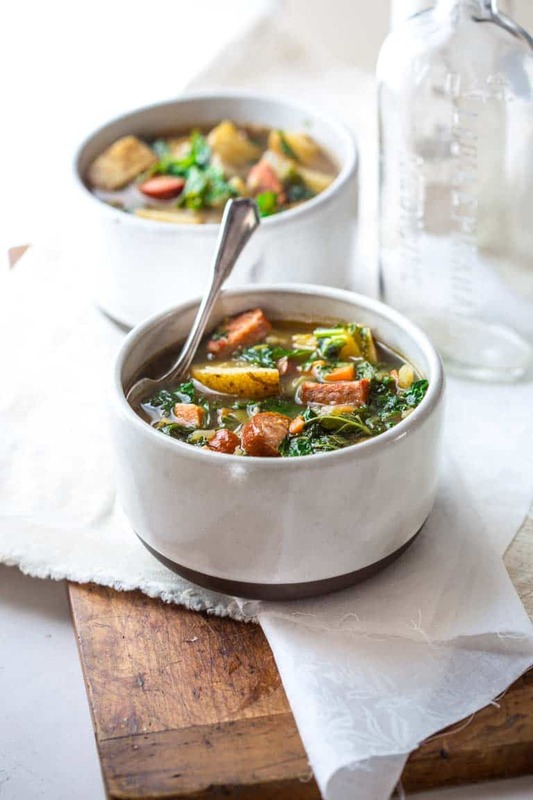 Instead try this totally comforting and satisfying stew. 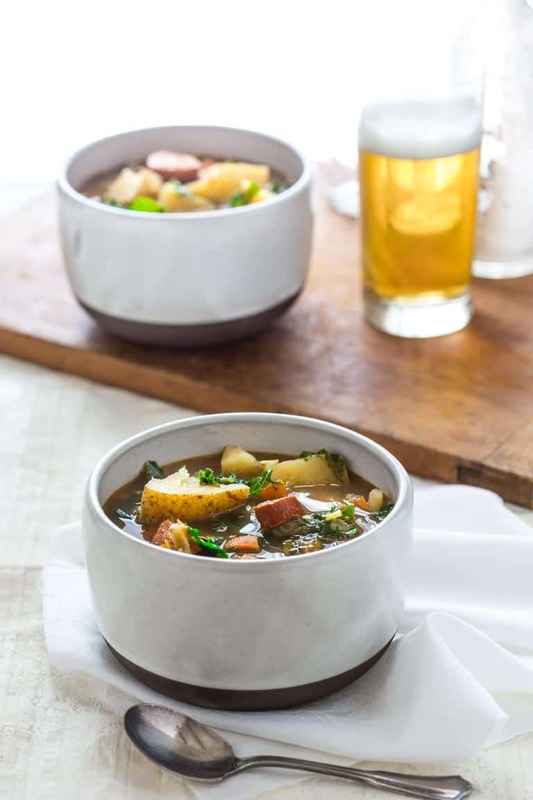 Speaking of which, onto this soup… Or stew. Whatever. It is so flavorful and loaded, nay bursting, with vegetables. 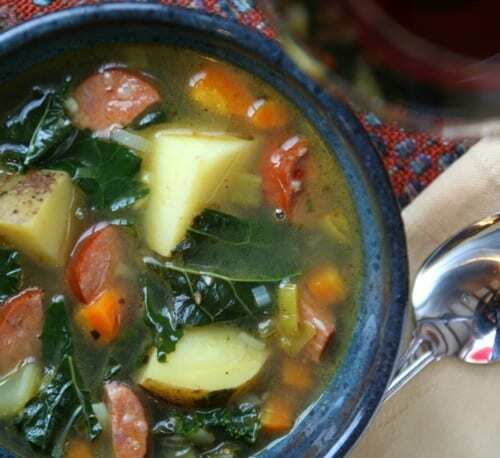 It is so thick and chunky, redolent with garlic, anise and smoky andouille you’ll just need a hunk of bread to make it a respectable meal. 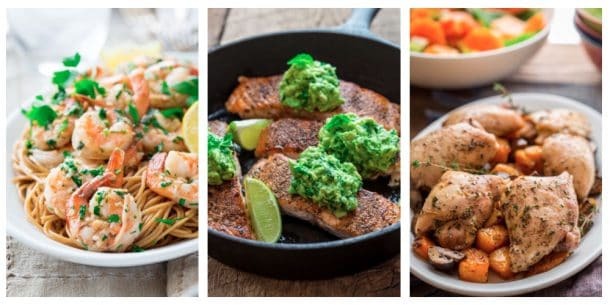 This recipe is on the Best Of Healthy Seasonal Recipes because since I shared it six years ago I have made it so many times! 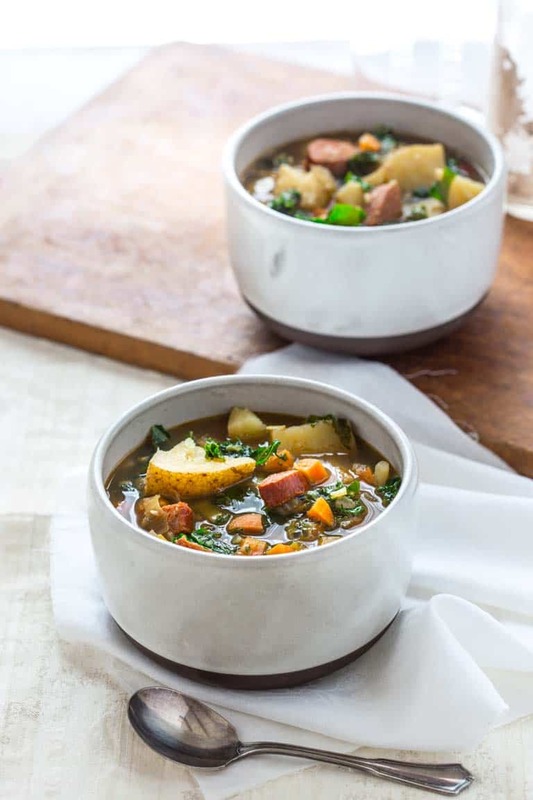 This stew is perfect at this time of year, before stuff starts growing again. When you want something filling and comforting. 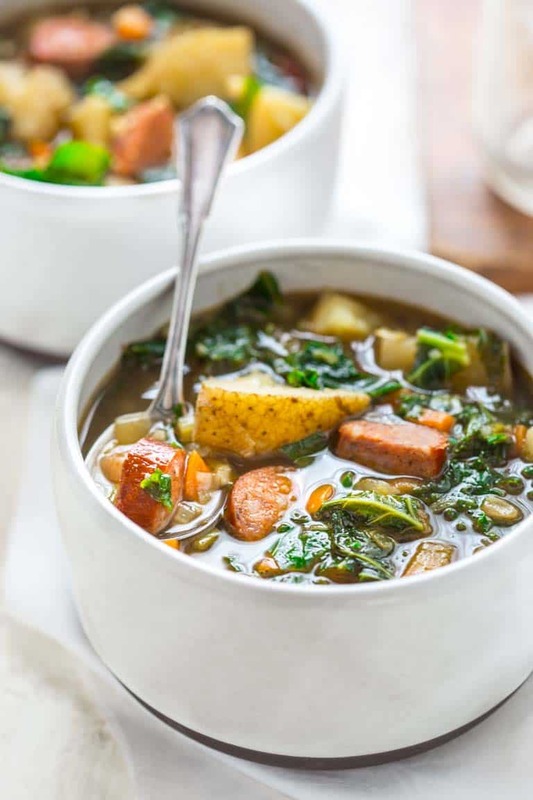 But psst, this healthier version of potato and sausage soup is only 260 calories per serving, because it is bulked up with so much veggie deliciousness. Heat oil in a large heavy-bottomed soup pot over medium heat. Add garlic and leek and cook, stirring often until the leek is starting to soften and the garlic is fragrant but not browned, 2 to 3 minutes. Stir in carrot, celery, salt, pepper, marjoram and anise, increase heat to high and cook, stirring often until the vegetables are starting to softened and the bottom of the pot is starting to brown slightly, 5 to 7 minutes. Add wine and cook until mostly evaporated, 2 to 3 minutes. Add broth and potatoes, cover and bring to a boil. Stir the stew, then layer the andouille or kielbasa on top followed by the kale, cover and return to a boil. [Note: There will be what looks like a LOT of kale on top that will gradually steam down.] Reduce heat to maintain a simmer and continue cooking, stirring ocassionally, until the potatoes are tender, 12 to 15 minutes. Stir and serve. 18 mg Cholesterol, 0 g Added Sugars, 956 mg Potassium. To make ahead: This stew is even better on day two. If it is too thick, add a little broth or water. Here are some of the photographs from the original post in 2011. Yes it is great. It does thicken considerably though, so just add a little broth when you reheat it. What is the sodium content in this soup? This soup sounds awesome! My butcher makes a fantastic andouille that I know would be fantastic in this. I love house made sausage, so I know I would love an andouille! That would make this soup fantastic! I can appreciate a good bowl of soon much better now having spent 2 weeks in Vermont. With this kind of cold weather outside, I can’t imagine a better dish. So yummy! And the bad news is that March isn’t really the way I think of spring here, it just stays winter. Though my daughter just told me that it’s supposed to get up to 60 on Thursday! Woah! 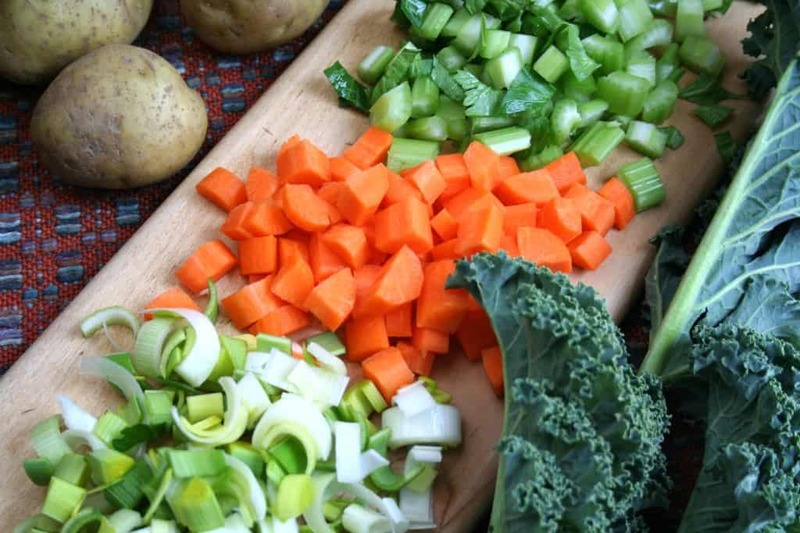 i’ve never understood people knocking potatoes – they have lots of nutrients! and this soup is just an awesome way to use them. love the inclusion of kale too. Yay, Team Potato! Ha ha. Thank you for stopping by Amanda. So true. Thank you so much Thalia. I can see why this is on your ‘best of’ list! 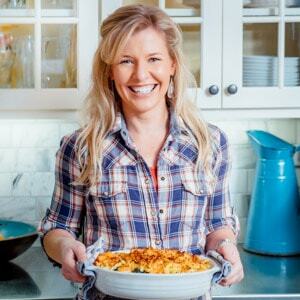 I agree, I feel like people shy away from potatoes but they really add so much, flavor and nutrition-wise. 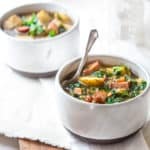 I have this soup on my list now – looks delicious!! That’s great to hear Tessa.